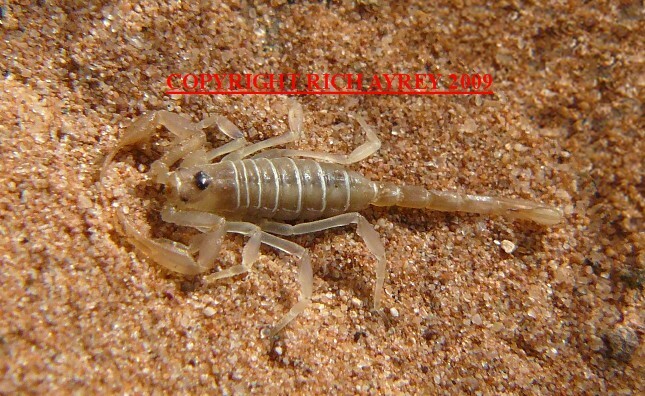 The photo of this approximately 1" Arizona scorpion was taken near Yuma, Arizona in an area of loose sand. I am lucky to have a pic of this species of Arizona Scorpions. This photograph and all photographs by Rich Ayrey, unless otherwise noted. Do not reproduce without the written permission of the photographer. This Flagstaff, Arizona Scorpion site copyright Rich Ayrey 2008-2017. This Arizona Scorpion site created 09/26/08. This Arizona Scorpion site last updated 01/17/2017.